9-volt active humbucker for aggressive playing styles. Recommended for old school metal, garage, punk, thrash, drop tunings, and other heavy rock styles. The "other" USA-made active humbuckers use unbalanced inputs in a differential preamp. The problem is, an unbalanced differential preamp is not very effective at cancelling hum. Our engineers figured out how to capture the tone that players want in an active design, but using balanced inputs. 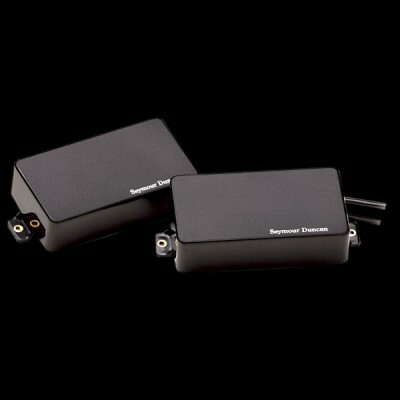 The result is 12dB to 14dB less noise, plus more lows, more highs, and more output. Simply put, Blackouts have more tone than other active pickups. Blackouts are available in individual neck and bridge models, or as a two-pickup set. All versions come with all necessary mounting hardware, including pots, jack, and a battery clip. For all humbucker guitars. The blade magnets make this pickup suitable for both humbucker and Trembucker string spacings.